So I have to confess that growing up I was never a huge fan of eggs. I did not mind them in things like cakes or cookies. The only way I ate them was hardboiled and made into deviled eggs. Then I met my husband and he liked to make breakfast on the weekends, how could I say no to that. So slowly he got me to eat scrambled eggs with cheese of course. Then came the omelette, which is really scrambled eggs with extra stuff. I must admit that my husband makes wonderful omelettes. So when I stated working on my list of things to make this year, I had poached eggs on my list. Which I had not made up until this point. I asked my husband if he had eaten poached eggs. His response was that poached eggs were what you used to make Eggs Benedict. Having made hollandaise sauce before, this should be easy right? 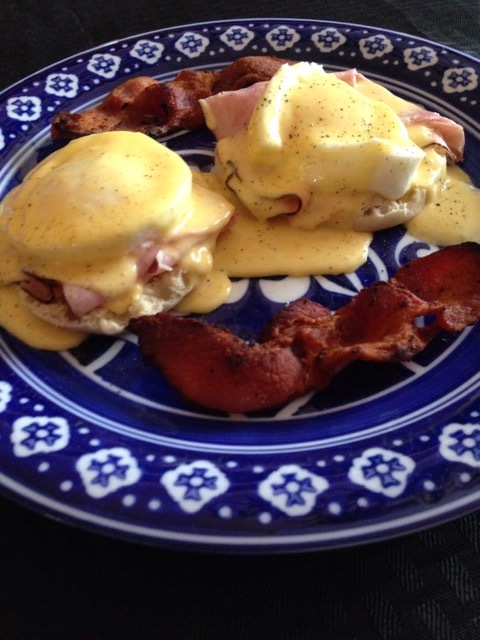 Over the weekend I poached my first eggs and made Eggs Benedict. It was very tasty and rich. My first three eggs were a little over done having cooked them for four minutes, the next three I cooked for three minutes and turned out perfect.